discover the most attractive, rare & valuable form of rubies! Star Rubies are beautiful gemstones that display a six-ray star that seems to glide magically across the surface of the gem when the latter is moved. This six-ray star is caused due to an optical phenomena known as "Asterism". The term "Asterism" is derived from the Greek word "aster", which means star, so asterism is commonly referred to as "star" or "star-effect". 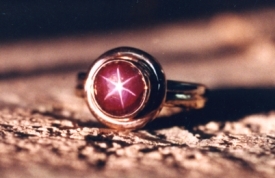 In simple words, asterism is a star-shaped light effect across the surface of gems. Other popular gemstones that display asterism are Star Sapphire, Star Rose Quartz, Star Garnet, Star Diopside, Star Moonstone, Star Spinel and Star Opal. More about Star Rubies on the Star Ruby Info page. Check out famous star rubies... the Delong Star Ruby, the Rosser Reeves Ruby, the Midnight Star Ruby and the Star Bharany Ruby. Visit The Star Ruby Shop, to purchase loose star rubies, ruby cabochons, faceted rubies, star sapphires, and more. All Guaranteed Natural and Untreated. 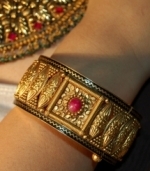 © 2007-2011 StarRuby.in™ | All Rights Reserved | StarRuby.in is the online property of Harshil Jewellers based in Mumbai, India. Contact Us.